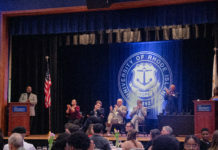 Those in Narragansett who oppose University of Rhode Island students living “down the line” may be one step closer to further regulating how students rent off campus. On Monday, the Narragansett Town Council is slated to workshop a proposed ordinance that, if passed and enforced, could limit the number of students living off campus together to four people. The proposed changes come from the Narragansett Ad Hoc Committee on Rental Issues, a volunteer committee created after the spring 2014 “riot” on Green Lane in Eastward Look. If the recommendations outlined in a memo from Harry Schofield, chair of the Zoning Enforcement Subcommittee of the Ad Hoc, are passed, landlords who wish to house more than four “unrelated renters” would need to apply for a Special Use Permit (SUP) in order to do so. According to the recommendations, SUPs would not be issued to either properties themselves or properties that house tenants who have received an orange sticker in the past 12 months. Landlords who own SUP properties would have to submit to annual inspections and participate in a URI training session. While no statement from the Ad Hoc committee has directly stated that these ordinances are being proposed in an effort to drive students out of Eastward and like neighborhoods, it is tough for me to take the motives they have listed at face value. Â I am a senior whose five-person house has never been stickered in the two years I’ve lived “down the line”. Â Â Â Â Â The density of houses is too great for the number of students who currently live in Eastward. Ray Kagel, president of the landlord advocacy group Narragansett 2100, said that this is a common excuse used by towns who are looking to regulate student rentals. Â Â Â Â Â Noise complaints. Though this category is the largest in a chart made by Police Chief Dean Hoxie, only 382 were made in the 2014-2015 academic year, a substantial decrease from the 657 reported the year before. Â Â Â Â Â “Signage blight.” Yes, the “for rent” signs on properties are a real concern. Essentially, the committee is proposing that by enforcing the amended ordinances, partying and noise violations will decrease, insinuating that large houses are the biggest perpetrators and disturbers of the peace. Â Interestingly, some of the biggest, most disruptive parties I have been to in college have been at two- and three-person houses. Â Â Â Â Â Language seems to be key for those in favor of redesigning and enforcing zoning ordinances. Â Technically the ordinances will restrict “unrelated people living in single person homes,” according to a memo drafted by Schofield. Â So “students”? Â Let’s cut some wordage and just say students. Â Â Â Â Â The number of students per house is limited, thus leaving many students cut out of their five- and six-person leases. Â Â Â Â Â The demand for rental properties will increase as more students look for housing. Â Â Â Â Â Landlords will increase the rent on their properties parallel with the demand. Â Â Â Â Â Students will begin to look for rentals outside the traditional Eastward Look and Narragansett Pier neighborhoods. Â Â Â Â Â URI will still have on-campus, off-campus, parking, Sakai and URI Secure issues. Like every year. Â Â Â Â Â Residents will still have complaints. As a student who has behaved responsibly and respectably while living in Narragansett, I find these ordinances, proposed under the guise of safety, offensive. I encourage students to engage with their adopted community and speak against the gross generalizations that the Ad Hoc committee is making about off-campus residents. Student Senate will be holding an off-campus clean up on Oct. 25 from 11 a.m. to 2 p.m. in an effort to remind Narragansett of the good students do for the community. The Ad Hoc Committee will present their proposed ordinances in a Town Council workshop that is open to the public on Oct. 26 at 6:30 p.m. for those students who wish to voice their concerns. “Residents deserve to get their town back,” Schofield wrote in his memo. Well sir, I would like to argue that paying rent at $550 a month per person, not including the utilities, electric and trash bills off-campus students pay to local companies, should be enough to qualify us as residents.